Wait. Why is the bookstore moving, AGAIN?? It has come to our attention that perhaps there is some confusion surrounding our upcoming move. Though we worked hard to make our current location a permanent home for the bookstore, there have been a host of issues over the course of the last two years with our building on Buchanan ST. Though our landlord assured us that our building was zoned commercial and, that as it had hosted businesses in the past, we would have the green light to go forward with housing the bookstore here, it proved to not be so. In our excitement to move forward, we took him at his word, signed our lease, and began the moving process. Regretfully, we were soon informed by the city that we would be facing numerous costly renovations in order to be ADA compliant which meant negotiating an increase in our monthly rental payments to assist with the necessary requirements to bring the building up to code. Moving forward, we suffered a host of flooding issues in our basement and countless plumbing issues; the last of which was a collapsed sewer line. The owner of our building informed us in early February that he would begin to show the property to potential buyers and, though we were panicked at first, wondering where we would be moving our store as well as our family (as we currently reside in the upstairs of the building) we began to see the silver lining in that the truth was that the constant issues with the building were contributing to higher stress levels and that, as our business continues to grow, we are quickly outgrowing our current space. With an outpouring of support within our community, we were able to find a rental home that’s just a stone’s throw away from the bookstore’s new home for our family to comfortably live (we won’t reside in the shop anymore) and discovered a truly wonderful new location for your bookstore! 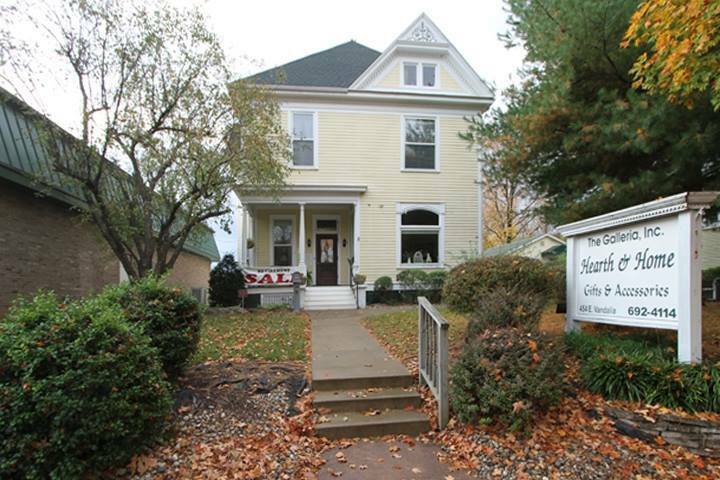 This is your bookstore’s new home, at 454 E Vandalia Street in Edwardsville! It is absolutely gorgeous inside, with a breathtaking staircase at the entry and a beautiful stained glass window. There are two fireplaces to cozy up to with a good book and a cup of tea and the the convenience of 14 parking spaces. The building is ADA compliant and just oozing charm from every nook and cranny. With a fair amount of encouragement, we’re hosting a crowd funding project as a means to save the bookstore; to secure a new, warm and welcoming home for our community to gather and connect. We’re not comfortable soliciting donations but, rather, we’re offering rewards/incentives to those of you who are in a position to contribute. No contribution is too small; every little bit will inch us closer to our goal. The funds will be utilized to aid with moving expenses, a few months of carrying multiple rents, the security deposit on our new digs and the required deposits to the utility company, and to compensate for the inevitable loss of revenue during said move. Our community has raised over $6,000 so far! You can check out our fundraising campaign to see what wonderful goodies we’re offering in exchange for your support during this exciting, albeit financially stressful, time. We’re looking forward to our new home but decidedly overwhelmed with the task of moving thousands of books, heavy bookshelves, and furnishings to the new digs. The big move will begin Sunday, April 26th, and we’re hoping to have all shelves moved and in place by Monday, April 27th, so we can set about the task of unpacking everything and creating a welcoming, charming, cozy space for your bookstore. Many have asked how they might volunteer to help with moving everything from Point A to Point B, so we’ve created a sign-up sheet! 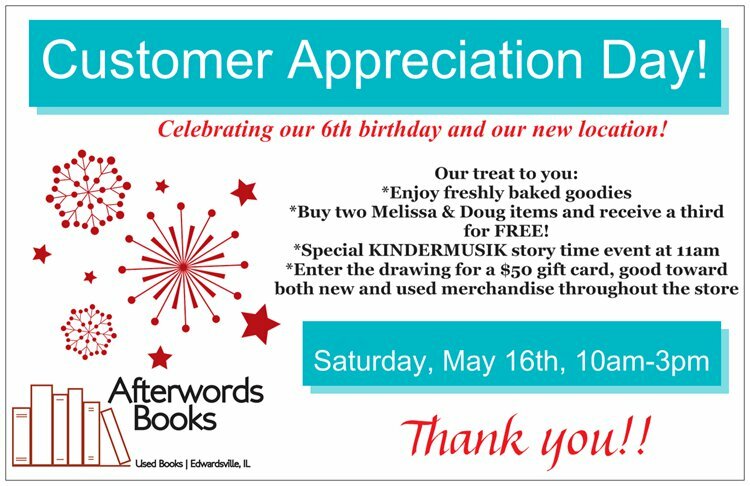 Our Customer Appreciation Day is Saturday, May 16th, and we can’t wait to share the new space with everyone, celebrate our 6th birthday, and, most of all, celebrate you and all you do to support our little bookstore!